Dr. Marlene Kanga, AM, FTSE Hon. FIEAust, Hon. FIChemE, is the President of the World Federation of Engineering Organisations (WFEO), and has had a successful career in the oil, gas and chemical industry. A previous National President of Engineers Australia, she was part of the team that initiated and ran the Engineers Australia Year of Women in Engineering in 2007 and was Chair of the National Committee for Women in Engineering in 2008 and 2009. Building on Engineers Australia‘s proud history, the Engineer of the Year Awards (formerly called Individual Awards) confer recognition for outstanding individual engineering achievements and promote those engineering professionals who show innovation and resourcefulness in their work. 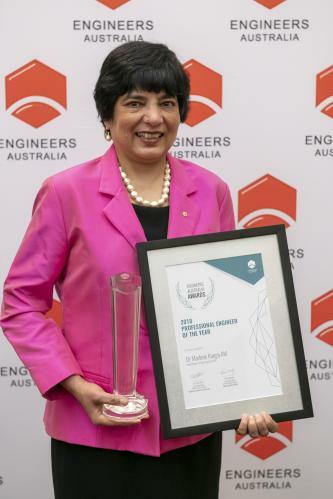 Engineers Australia Awards recognise professional achievement, or engineering excellence in its various forms, and promote the profession of engineering. Engineer of the Year Awards nominations are open for inspiring engineering professionals who demonstrate contribution to the well-being of people, communities and sustainable engineering practices, contribution to and promotion of the engineering profession, pioneering in the use of materials and/or methods and the formulation of resourceful, innovative and aesthetically appealing engineering solutions.